Two exciting technology presentations that will stimulate discussion for some while to come. Luke Barker -Technical Director and Jason King – Chief Engineer will be speaking at Advanced Engineering 2018. Luke joins the Aero Engineering Conference (Day 2 14:00) where he will share his insights on the potential impact of next generation electric motor technologies within aerospace. Integral e-Drive showed a 3MW Aero Motor/Generator weighing just 62.7 kg at this year’s Farnborough Airshow. It generated a great deal of interest as it featured in discussions regarding the emissions and noise reduction of new modes of air travel. Jason joins the Automotive Engineering Conference (Day 2 12:30). He will present how Integral e-Drive are taking the experience and technologies that powered the record breaking Volkswagen Motorsport I.D. R Pikes Peak to drive the development of new and future road vehicles. The Track to Road programme enjoys the benefit of the world leading Motorsport research & development that Integral e-Drive undertake. Latest developments such as the e-Axle, partnering McLaren Applied Technologies Ltd and Hewland Engineering together with the supply of motors for the 2019 Aston Martin Rapide E illustrate just a few examples of its success to date. Billed as the largest annual event in the UK engineering calendar, Advanced Engineering 2018 is a two day event, 31 October to 1 November. This year sees it celebrate its 10th-anniversary. 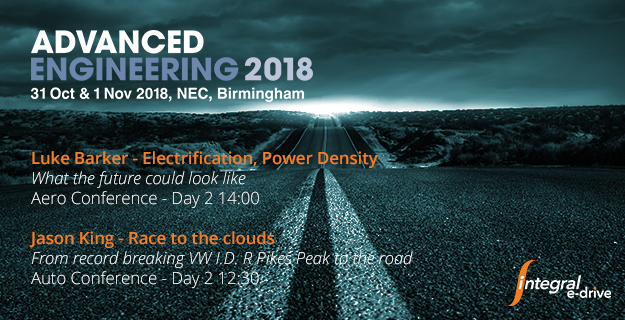 Make you plans to visit Advanced Engineering 2018, The NEC Birmingham today.